Dazzling and delirious, The Fall is a celebration of cinema, of old-fashioned storytelling and globe-hopping spectacle. The long-in-the-making (15 years!) passion project of the mono-monikered Tarsem (full-name: Tarsem Singh; day job: commercials director), this dark fairy tale is steeped in the spirit of early Hollywood - the shoot-'em-ups, the cliffhangers, the romance and the corn - and goes out of its way not to use CGI. For fans who have grumbled that Steven Spielberg sold out in the latest Indiana Jones by opting for computer-generated effects over old-school sets, props and locales, The Fall provides a rousing alternative. Shot on location in 18 countries - on otherworldly desert landscapes, in blinding-bright Indian temples, across verdant Bali forests and vast alpine vistas - the film is an exhilarating visual treat. If the narrative and the acting aren't always on a similarly sublime plane, there is still enough invention, action, goofy theatrics and genuine charm to make the movie pretty darn magical. 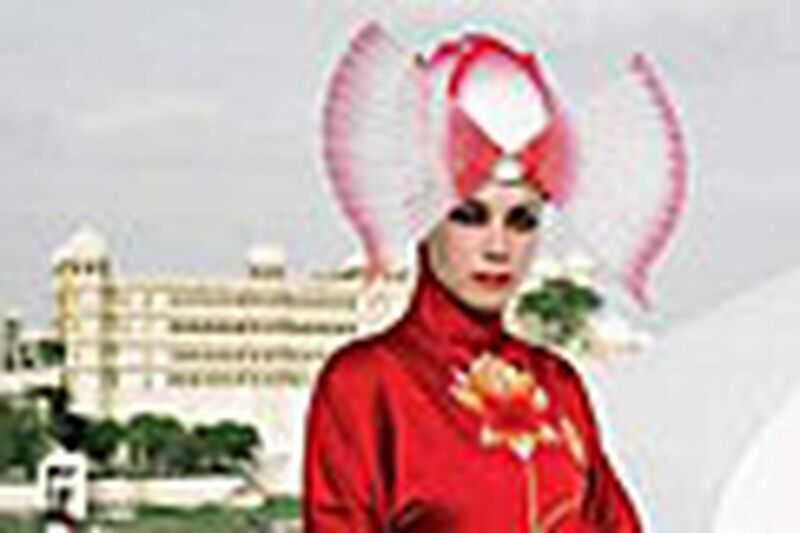 And then there are the costumes - wildly colorful getups designed by Oscar-winner Eiko Ishioka. Opening with a dramatic black-and-white sequence that's like a dream version of a silent screen western - a railway bridge, a horse, a masked man, an Indian, and a girl - The Fall is set in 1915, and spins off from a hospital where stunt man Roy Walker (Lee Pace), seriously injured during the shooting of a scene, lies in bed. Alexandria (Catinca Untaru), a little girl with a broken arm, wanders into the ward, the two strike a conversation, and he begins to tell "an epic tale of love and revenge." Untaru, a Romanian gradeschooler, is not your standard-issue kid actor. For one thing, her English is dodgy; for another, her big round face and funny waddle are not what you'd call show-biz cute. But this little girl holds the screen like a pipsqueak Brando, and her hushed murmurings, her darting eyes, the funny things she does with her hands . . . it's mesmerizing. Like Pan's Labyrinth and The Wizard of Oz, Tarsem's film dives deep into the imagination of a child, taking characters from her real world and transplanting them into the fantasy. Thus a hospital nurse becomes a princess (Justine Waddell), a movie star becomes a villainous despot (Daniel Caltagirone), a man delivering ice to the hospital becomes a be-horned warrior (Marcus Wesley). And Alexandria and Roy become linked, like a father and daughter, as they traverse majestic terrain, fending off evil spirits and enemy hordes. Like I said, The Fall is dark - suicide is a major theme. So are broken hearts and broken bones. In the end, Tarsem adds a glorious montage of silent movie stunt work - the kind of gravity-defying movie ballet that brings a smile, and stirs the soul. The Fall, even when it steers toward melancholy and tragedy, will do that: bring a smile, stir the soul. Directed by Tarsem. With Lee Pace, Catinca Untaru and Justine Waddell. Distributed by Roadside Attractions.